Cut through information overload to make better decisions faster Success relies on making the correct decisions at the appropriate time, which is only possible if the decision maker has the necessary insights in a suitable format. 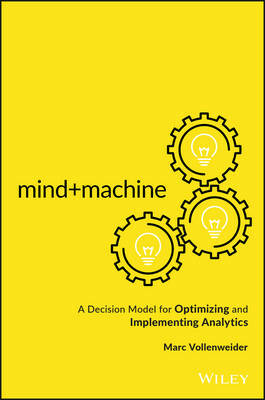 Mind+Machine is the guide to getting the right insights in the right format at the right time to the right person. Designed to show decision makers how to get the most out of every level of data analytics, this book explores the extraordinary potential to be found in a model where human ingenuity and skill are supported with cutting-edge tools, including automations. The marriage of the perceptive power of the human brain with the benefits of automation is essential because mind or machine alone cannot handle the complexities of modern analytics. Only when the two come together with structure and purpose to solve a problem are goals achieved. With various stakeholders in data analytics having their own take on what is important, it can be challenging for a business leader to create such a structure. This book provides a blueprint for decision makers, helping them ask the right questions, understand the answers, and ensure an approach to analytics that properly supports organizational growth. Discover how to: * Harness the power of insightful minds and the speed of analytics technology * Understand the demands and claims of various analytics stakeholders * Focus on the right data and automate the right processes * Navigate decisions with confidence in a fast-paced world The Mind+Machine model streamlines analytics workflows and refines the never-ending flood of incoming data into useful insights. Thus, Mind+Machine equips you to take on the big decisions and win.